Click here and you will be redirected to our partner "Vostok-Watches24", the for Europe authorised VOSTOK dealer and service partner of the VOSTOK watch manufactory. 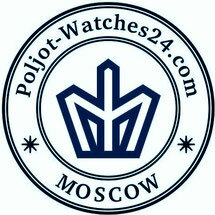 Here you will find the complete range of VOSTOK watches. The item will be shipped within 3 business days after payment. There will be a tracking number for your shipment. automatic movement 2416 by Vostok watch factory, 31 jewels, shockproof, date, power reserve 31 hours. metallic luminous hands, second hand ind pos. "2:00"